Talking it through as the blood drains. You can see that it was a messy affair getting the pig on the hook by the mud on my face, which stayed there the rest of the day. I’ve learned now that students won’t always tell you when you’ve screwed up, better check the mirror occasionally. Of course darling SWMBO and the interns didn’t tell me either. Finishing up the bleed. The pig is stunned by the gunshot and knocked unconscious. Bleeding it is what actually kills the pig. Miguel moving over to the scald tank. 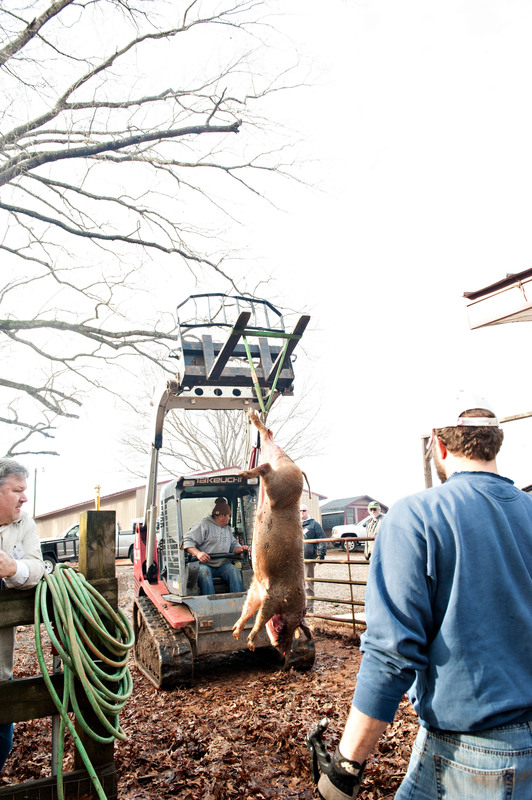 Although this was an “old-fashioned hog killing” we did utilize modern conveniences like a tractor and an electric hoist to make the work easier. It didn’t seem to take anything away from the process.